World Meningitis Day was started on April 24, 2012, by the Confederation of Meningitis Organization and its global members to encourage individuals, families and communities to learn about the signs and symptoms of meningitis, need for urgent treatment, and prevention through vaccination as part of its annual World Meningitis Day program. How is World Meningitis Day celebrated? It is a day to remember patient stories, raise awareness of the symptoms and preventive methods. It is celebrated by providing preventive vaccines for free and by creating awareness about personal hygiene as a preventive method. 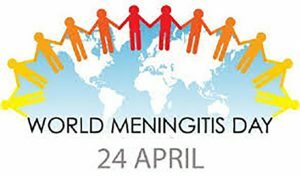 The Day is celebrated through a helpful toolkit created by the Confederation of Meningitis Organization to raise awareness. Meningitis Day can be celebrated by watching YouTube channel of the organization that has inspiring videos of patients and families who have experienced meningitis. World Meningitis Day has created global awareness about the disease. Every year more than 1.2 million people are affected by meningitis. Meningitis is an inflammation of the brain and spinal cord caused mainly by bacteria. Meningitis can develop rapidly and its symptoms often resemble that of flu, making it difficult for diagnosis. Personal hygiene and vaccination help to prevent the disease.